I don’t know how I decided to make this for my Indian “month”. In a way, I’m not quite sure that Chicken Tikka Masala qualifies as Indian, as there different stories about where it was first created; most of them agree it was in the UK. Recently though, chefs in India have starting endorsing it and making their own versions; its appeal to the rest of the world hasn’t gone unnoticed. Having lived in the UK for 7 years now, it’s a bit strange that I had never had a Chicken Tikka Masala before I made this version. I think I have made up for it though, since this isn’t any version: it is Heston Blumenthal’s recipe from his In Search of Perfection series. In the book, which is quite a good read even if you never cook from it, he describes how he built his own Tandoori oven and came to Cambridge to use an MRI scanner on some chicken breasts. As you can probably guess, I didn’t follow all of the instructions. Pop the garlic and ginger in the food processor and add the olive oil and salt to make a paste. Rub the chicken with it and place in the fridge for 3-5 hours. First, make a roux by melting the ghee in a pan, adding the flour and frying for a bit until the flour is cooked. Put in a plate and let cool. Then, fry the olive oil with the chilli powder for 2-3 minutes. Move to a bowl and mix together with the roux, the yoghurt and the garam masala (basically everything together!). 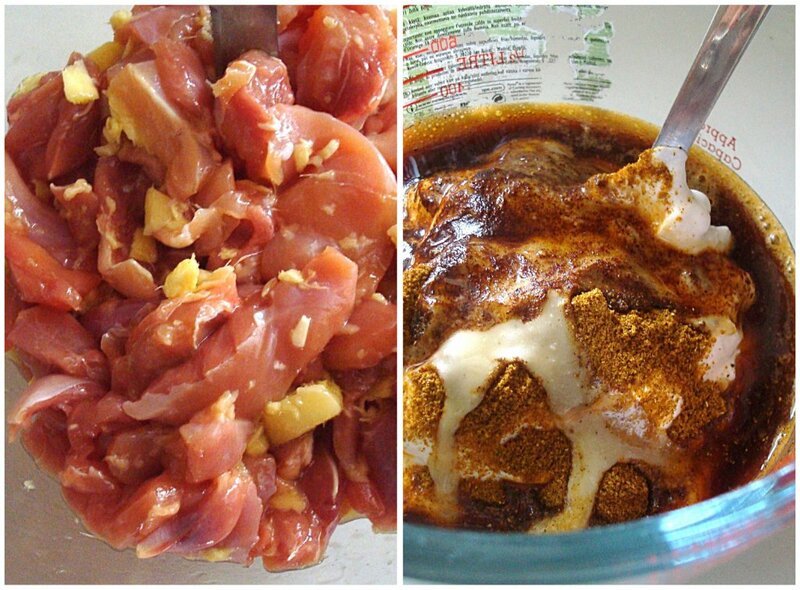 Brush most of the rub off the chicken and cover it in the marinade. Leave in the fridge for a few hours, up to 10 if possible. Toast the coriander and cumin seeds, add the tomatoes and water and cook until reduced. Strain everything through a sieve. In a frying pan, melt the ghee, add the chilli powder and fry for 2-3 minutes. Add the onions, ginger and salt and cook until soft. Add the tomato puree, the sieved tomatoes and the turmeric and garam masala and simmer until the sauce thickens. Add the chicken to the sauce and simmer for 5 minutes. Take off the heat and stir in the yoghurt and coconut milk. Sprinkle with the chopped chilli and some fresh coriander. The meat was moist and soft, with caramelised spots all over. Before I added it to the sauce I was thinking that you could easily serve it dry, with some cucumber raitha and naan bread. 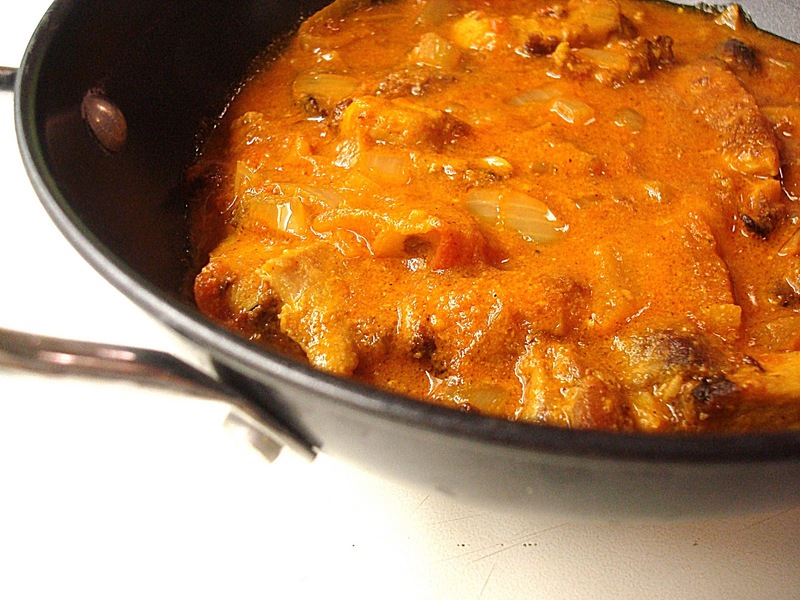 As it is normal with stews, the sauce was even better when we had the leftovers the next day. I served it with this Aubergine in Yoghurt side dish, some rice and homemade pita bread. Next time on Round the World in 100 Recipes: More curry. Actually, the best curry I’ve ever had. *I normally avoid publishing recipes taken from books, but a search online reveals that different versions of Heston’s CTM exist on other websites. This isn’t the original recipe (as it appears in the book) as I have simplified it to make it more home-cook friendly, so hopefully no one will get angry with me for putting it up here! Hi, never heard of using olive oil in a curry before. How does it taste? I have to say that I use olive oil for most things, just because that's what I'm used to. I doubt I'd be able to tell the difference from another fat with all the spices that go into a curry though! That looks delicious – I was looking for this recipe as I only have his other in search of perfection book. So you did away with the brining but it was still tender? and no charcoal – just a normal oven – that all sounds rather easier! 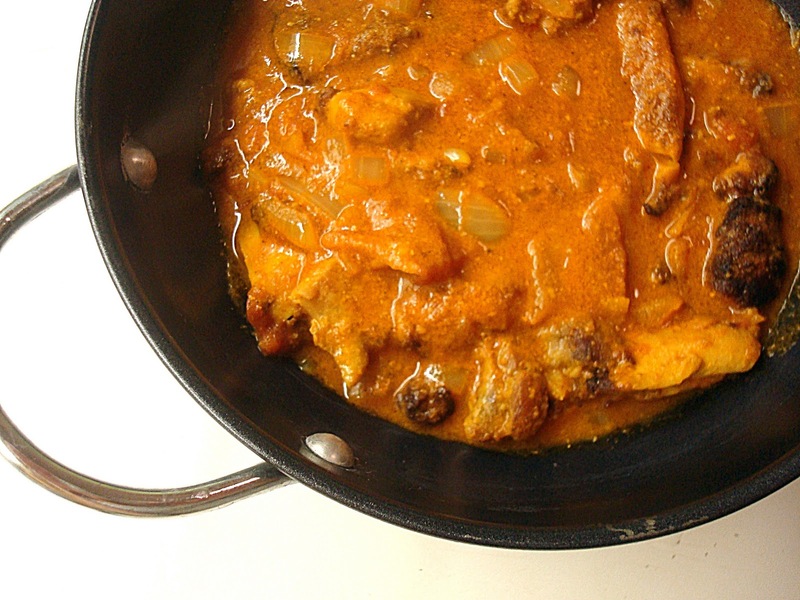 Pingback: Indiase kipcurry met aardappelen - Recepten @ planetfem.com |Heerlijke ideeen voor lekkere maaltijden!Recepten @ planetfem.com |Heerlijke ideeen voor lekkere maaltijden!